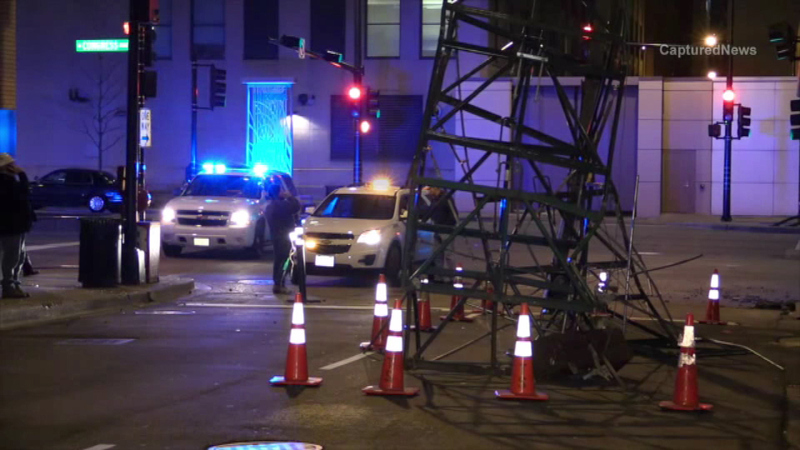 CHICAGO (WLS) -- Falling scaffolding and debris at the Chicago Stock Exchange building led to lane closures Friday morning on Congress Parkway and Clark Street. The scaffolding and debris fell to the street around 3:30 a.m. Friday from the building at 440 S. LaSalle Street. No injuries were reported. High winds may be to blame. Firefighters helped remove the debris, which was cleared by 4:45 a.m. However the westbound lanes of Congress Parkway remain closed near Clark Street while building crews work. A city spokesman said a cable snapped off the scaffolding due to wind. As a result, scaffolding blew over the side of the building, striking three stone panels. One fell to the ground, and crews worked to remove several more that were damaged. Officials do not know how long that will take.